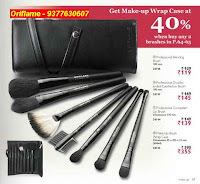 Use these Make Up Tips this Monsoon with these Oriflame Products I have specially chosen for you. Use Oriflame Beauty Perfecting Face Primer and apply a thin foundation using Optimals Beauty Matte Control Foundation because it absorbs oil easily. Use Oriflame Beauty Matte Control Pressed Powder to seal the foundation. Use Giordani Gold Bronzing Pearls to give color to your cheeks using the Giordani Gold Powder Brush. Outline and fill your lips with a color that matches your mood. Hope the tips in this post will help you to have a memorable monsoon filled with masti and magic!